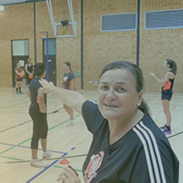 When your team has the ball movement in netball involves getting free from the opposition and creating space to receive the pass - progressing the ball towards your opponent's goal. When your team don't have the ball, movement in netball involves taking up good defensive positions, to ensure your players are able to put pressure on the other team to slow the attack and pressure the other team. The speed and agility movement videos below aim to improve your players' ability to drive onto a pass, offer for the ball and take up good attacking positions on court.